Brighton and Hove will soon be buzzing with Festival fever and it couldn’t be a better time to visit the city! We will be open to the public every weekend during the month of May between 11.30am and 6pm (including the bank holidays) as part of the Festival’s ‘Artists’ Open Houses’. The garden is looking really lovely now and there will be plenty of ‘outdoor’ art to see so all we need is some good weather! Visitors can browse the new art collection throughout the building or just pop in for a cup of tea and a sample of our homemade cake, or even book a cream tea – see www.theclaremont.eu/afternoon-tea. 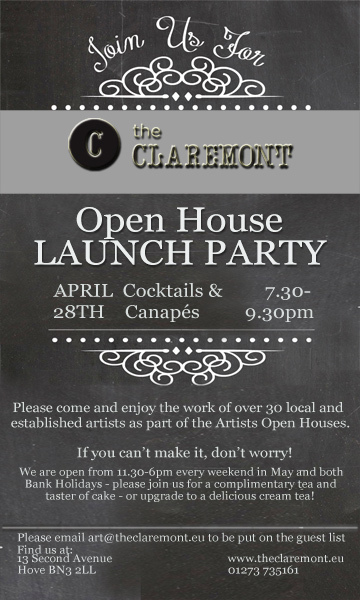 We would be delighted to welcome you, as a valued customer, to our launch party on 28th April (see below) – just contact us on art@theclaremont.eu to be entered on our guest list. We will also be hosting theatrical events during the weekend of the 14th and 15th and on the 21st May – see www.brightonfringe.org/box-office/shows/search/venue/1678. 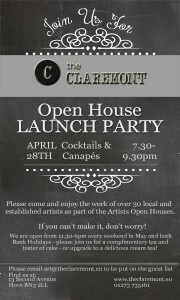 If you’re looking for a venue for a wedding or a party this would be a good time to come along and have a look around and we will be running a prize draw for a stay at the Claremont with champagne. The Claremont offers a truly relaxing and comfortable place to stay and has some great deals on offer for the summer too. +44 (0)1273 735161 to discuss your requirements. We look forward to welcoming you again and hope to see you!